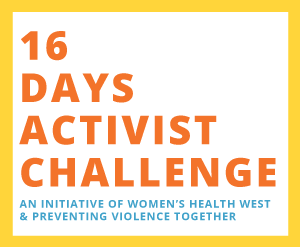 The annual 16 Days activist challenge is part of the international 16 days of activism against gender-based violence movement. Register your details below to take part and you’ll receive daily challenge reminders during the campaign. How did you hear about the 16 Days Activist Challenge? What challenges are you interested in attempting? We will send a daily activist prompts each day during the challenge. Why have you decided to take the challenge? Do you wish to subscribe to future WHW email correspondence?